Product review: Recommended Treat – by anon, 1 Nov 17 5/5 Excellent "Contact with the operator was easy by the phone number given on the voucher. First chosen date had to be cancelled because of poor weather. The resceduled flight went ahead one week later.The venue is easy to find. It has a good restaurant and facilities for visitors. There is a well signed reception desk and the pilot was quickly informed of my arrival. The venue (Newtownards Airfield) has a convenient car park. All staff were friendly, welcoming and efficient. The aircraft was clean and obviously well mainteained. The pilot was friendly and obviously very experienced.I felt confident and safe (after the briefing)in the aircraft (Cessna).The pilot and I agreed a route over Strangford Lough. It was a very enjoyable experience. I really enjoyed the wonderful views over the countryside and Lough below, with distant views of the english and scottish coasts and mountains. I would recommend it to anyone as a treat.I took photos and short movie clips. There was excellent visibility on the day.I booked the voucher by the experiences4all website. There were no problems using the booking facility and the voucher duly arrived within a few days of booking. " During a 30 minute flight you could fly South over Strangford Lough to Portaferry before turning North over the Ards Peninsular and back to Newtonards. Up to three people can fly, but they should not all be rugby players - they don't all have to be ballet dancers though. Contact with the operator was easy by the phone number given on the voucher. First chosen date had to be cancelled because of poor weather. The resceduled flight went ahead one week later.The venue is easy to find. It has a good restaurant and facilities for visitors. There is a well signed reception desk and the pilot was quickly informed of my arrival. The venue (Newtownards Airfield) has a convenient car park. All staff were friendly, welcoming and efficient. The aircraft was clean and obviously well mainteained. 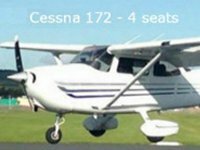 The pilot was friendly and obviously very experienced.I felt confident and safe (after the briefing)in the aircraft (Cessna).The pilot and I agreed a route over Strangford Lough. It was a very enjoyable experience. I really enjoyed the wonderful views over the countryside and Lough below, with distant views of the english and scottish coasts and mountains. I would recommend it to anyone as a treat.I took photos and short movie clips. There was excellent visibility on the day.I booked the voucher by the experiences4all website. There were no problems using the booking facility and the voucher duly arrived within a few days of booking.